Ladies and gentlemen of the Jewish/Israeli blogosphere please put down your waffles and lend me your ears. This is Jack and as many of you know I am the current admin for Haveil Havalim, the weekly roundup of the Jewish/Israeli blogosphere. We are looking for some bloggers to serve as hosts for H.H. If you are a blogger who is looking for a way to build traffic and gain some notoriety for your blog this is a really easy way to do it. All it requires is a small investment of time. If you are an uberblogger who already generates oodles of traffic hosting is an easy way to generate positive karma and potentially gain access to the finest waffles in the blogosphere. Want to learn more? Send me an email at talktojacknow-at-sbbglobal-dot-net or leave a comment at my blog and we'll talk. Try it, you'll like it. While insuring your car here in Israel is far from inexpensive, it's cool that all sorts of clauses help bring down the costs. As religious Jews, we don't drive on Shabbat or Chag (unless it's within the scope of emergency EMT response for Magen David Adom/Hatzala, or IDF kitat konenut CTU response). It is hereby negotiated, that regardless of what is previously stated in this policy, the [insurance] company will not be liable to pay compensation for any accident, loss, damage or debts that occur or result during the time when this insured vehicle is driven on Shabbat or Jewish Holidays, when it is forbidden [by halacha] to drive from the start [of Shabbat/Chag] until the time when [Shabbat/Chag] is complete, according to the times stated by the Israeli Chief Rabbinate, unless the driving is for "pikuach nefesh" (risk of life). In exchange for the above, this policy will be reduced according to the "Not Driving on Shabbat and Jewish Holiday" clause. I guess such a policy could exist elsewhere on the planet; anyone know if it does? PS: Yes, I know I've been away from blogging for a while...but for good things...family smachot, etc. Will try to get back in the saddle (I have missed blogging). Nefesh b’Nefesh thinks so. In fact they are running a major campaign right now to help make the process smoother and your decision easier. To begin with, they have their application form (which I guess is for those of you already on the more serious track, or in need of more immediate information such as about Financial Assistance and Aliyah Services). Well, for all of you, Nefesh b’Nefesh is running live Webinars where you can learn all about Aliyah, and get answers to the different questions you might have. Here is a list of upcoming Webinars. It’s like having a Shaliach visit your house (presumably with better information. If you made Aliyah before NBN existed, you know what I mean, and are probably still paying for it). Click here for the times and dates of all the Webinars and local Seminars. And if you’re a doctor, it’s unbelievable, grants and assistance up to $60,000!!!!!! I’m quitting my job and going to Med school (oh, and then figuring out how to make Aliyah twice). Anyway, if you are even just curious about Aliyah. Check it out. and no one informed me? I seriously feel left out here. But, since it's a party, I'm joining right in! We Don't Want To Wait! It's a Mitzvah to be Happy, All the Time! That's it. The inmates have taken over. Let us hear your ideas. Rabbi Chaim Brovender posts a Halacha Yomit Video -- a daily, short video on a variety of Halachic topics, updated Sunday through Thursday. The introductory topic is Hilchot Brachot -- the laws of blessings on food. Blog readers are encouraged to participate by posting comments and questions. Click here to view Halacha Yomit Videos. And you can still sign up today for WebYeshiva's free 14 day trial. Haveil Havalim #151- The P.S.D. Edition is live. Go take a look at the latest roundup of posts from the Jewish/Israeli blogosphere. Friends, I am pleased to provide you with a hot tip about a tasty Purim treat that is coming to you real soon. It is the waffle flavored Hamantaschen. Not only are they a delightful treat for you and your family, they're great Shalach Manos. More information on this will be forthcoming shortly. In the interim please stay tuned for the 151st edition of Haveil Havalim. It is going to be posted a little bit later at my blog. "I'm in the dark here"
Or so goes the claim in Gaza. Here is a Reuters photo from a Gaza parliament meeting taken last week by the unbiased media. 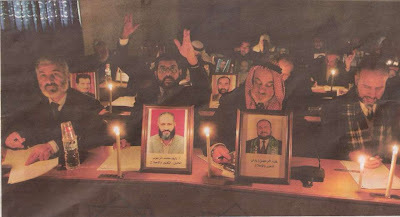 You can see all the Gazan Parliamentarians forced by Israel to legislate by candlelight. 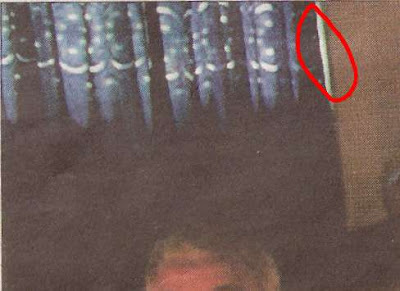 Of course, if you look a little closer, at the top left window, around the closed drapes covering the windows, or more specifically at the light streaming in from around (and even through) the drapes, you’ll see that this staged photograph was taken in the middle of the day. JoeSettler wants to know, hasn't the media agencies learned anything since the Lebanon war, or are they willing dupes? I am posting this here in the hope that readers will forward the information to concerned parties in the Bay Area - we need all the help we can get fighting anti-Semitism in Berkeley and San Francisco. Friday, January 25, 12:00 - 1:00 PM AND 4:00 - 6:00 PM. On Friday, from 12:00 - 1:00 PM, Jewish Voice for Peace will hold a protest vigil in front of the Israeli Consulate. From 4:00 - 6:00 PM, A.N.S.W.E.R., the National Council of Arab Americans, Free Palestine Alliance, Al-Awda, and others will also demonstrate at the Israeli Consulate against Israel’s actions in Gaza. What these groups do not acknowledge is that Israel's actions are in response to a sustained barrage of missiles from Gaza into Israel - 450 in 10 days. They also fail to mention the murder of Carlos Chavez, a young kibbutz volunteer, targeted by a sniper from Gaza while planting potatoes. The groups sponsoring this demonstration all demonize Israel as an "apartheid" state, endorse Israel’s destruction, and refuse to even acknowledge the violence the Palestinians perpetrated against Israel that led to Israel’s defensive actions. Israel disengaged from Gaza in September 2005. In line with international demands, Israel opened border crossings with Gaza when there were no specific terrorist threats and turned over the Rafah crossing to the Palestinians with international observers. Despite this, the Gazan militant groups, many supported or funded by Hamas, intensified their rocket attacks into Israel. The situation in Gaza is exploited by Hamas to deflect attention from its own role in creating it, but even the Arab media is skeptical. Just this week, Abdel Rahman Rashed, of the pan-Arab Arabiya news channel, said Hamas was responsible for the suffering of the 1.5 million Palestinians living in the Gaza Strip. San Francisco Voice for Israel/Stand With Us will counter the anti-Israel/ pro-terrorism voice and genocidal hate and lies of the anti-Israel groups. Our presence in the past at these events has proven highly effective at countering their message and making sure that the anti-Israel activists can not push their propaganda on the public unopposed. Please plan on attending at least one of these actions and bring your noisemakers, flags, and signs. As always, feel free to make your own signs but please no signs or graphics offensive to any racial or ethnic group including but not limited to Arabs, Islam, or Palestinians. Signs in violation of our policies will not be allowed. Demand Cpl Gilad Shalit be returned home safely! Israel is trying to avoid a humanitarian crisis. Israel sincerely strives for peace. Israel is the aggrieved party in this conflict - since withdrawal from Gaza, rockets and other terror-attempts from Hamas-Gaza have increased enormously. Hamas can afford rockets - why can't it improve the lives of its subjects? Hamas and Palestinian activists are waging war on the civilians of Southern-Israel. Hamas tries to kill civilians - that they are mostly unsuccesful is a miracle; it would be criminal to wait for them to become more efficient at that enterprise. MECA, which is one of the most hateful anti-Semitic groups, is co-sponsoring other protests elsewhere in the United States. Chicago: Tues., Jan. 29, 5 pm at the Lakeshore Theater, 3175 North Broadway (at benefit for the Friends of the 'Israeli Defense Force'). Initiated by ISM. Call 773-463-0311 for more information. New York City: Saturday, Jan. 26, 1 p.m. at the Israeli Embassy, 43rd St. and 2nd Ave.
Seattle: Friday, January 25, 4 p.m., Westlake Park, 4th & Pine Sts. Washington DC: Friday, Jan. 25 (time tba), at the Israeli Embassy, 3514 International Dr. N.W. Please take part in counterprotests, and write to your congressleite and newspapers in your area regarding the hateful agendas and factual distortions of MECA and other groups. If you do not take action, who will? And if not now, when? The Maggid of Bergenfield is back, telling timely Torah tales and taking no prisoners. It's around 3 months to Pesach. I like Pesach. I like the Seder. I like the Matza (at least at first). I like the time off from work. My wife on the other hand, well I'm not sure if she likes Pesach as much as me. Pesach cleaning. Pesach cooking. Pesach Stress. Don't get me wrong. It's not that I don't help, but somehow our definitions of clean don't 100% jive. My solution is - GO AWAY TO A HOTEL. That way we get the best of both worlds. No Less cleaning. No cooking. No work. Entertainment for the kids and adults. Things to do. Service. Good company. And I could go on. TravelDeal Israel has a number of Pesach Hotel packages they are offering - with packages tailored especially for the English speaking audience. Go to their website. You can get a free information packet on all their various Pesach packages (I want to go to the Kinneret - I hope the wife agrees), how much they cost, what the entertainment will be, probably even the menu. And if you choose one of the Jerusalem Hotels, you get to say "HaShana haZoh b'Yerushalayim haShleima." 1. Jerusalem belongs to all the Jewish people, so Diaspora Jews should have a voice in all matters of dividing Jerusalem and its fate. 2. Diaspora Jews do not live here, don’t serve here, don’t risk their lives here and therefore don’t have a say on matters involving dividing Jerusalem and its fate. Position 1, when presented by Jews in Israel or in the Diaspora assumes that those Jews in question in the Diaspora are involved, knowledgeable, and connected to Israel and have the same opinion as the presenter. Position 2, when presented by Jews in Israel or in the Diaspora doesn’t assume that Jews in the Diaspora are involved, knowledgeable, and connected to Israel, also assumes that not living here removes the right to an opinion, and more than likely assumes they don’t have the same opinion as the presenter. Of course, both positions are wrong (if they weren’t what else would I have to write about). The reality is that Jews in the Diaspora play a major role and have a major say in the future of Jerusalem. It is nearly impossible to go to any park, hospital, playground, theatre and so on and not see plaques on the walls thanking the donors for their significant contributions. I recall Olmert standing next to numerous donors from the Diaspora who helped build Jerusalem - and giving them accolades awards, and thanks (and never once did he say they shouldn't push for that new park or playground). Diaspora Jews have and will continue to play a significant role in building Jerusalem and the future of Israel. The mistake here is the question itself. There is no question that Jews in the Disapora don’t have the right to put forward a position involving dividing Jerusalem. Jews in Israel do not have the right to put forward that question either. Jerusalem and Eretz Yisrael isn’t something given to this generation (or this generation’s politicians), it belongs to all Jews of all generations (that is part of the concept of Yovel buy the way). No government has the right to give it away. True we can lose parts of it in war, we can be forced to surrender our sovereignty, as has happened. But to willingly give it away! No Jew in the Diaspora or Israel has the right to negotiate the division of Jerusalem or Eretz Yisrael. But we all have a say in building its future. · People have been arrested and interrogated by the police for putting up anti-Bush and anti-Olmert posters. · People have been arrested and detained by the police for distributing literature to the foreign press. · There are seven children, all girls between the ages of 13 to 15, who have been imprisoned for three weeks now, after being arrested for their presence in an unauthorized hilltop community. (One child was released this afternoon.) According to Dr. Yitzchak Kadman of Israel's National Child Welfare Council and others, they are being subjected to criminal abuse. The Israeli media has had little to say about all these outrages. According to this post (see also here), a blogger (Reb. Nati) was brought in today by the Israeli police, and interrogated by the Shabak (! ), apparently – according to the questions he was asked – for the crime of having expressed anti-government opinions on his blog. If we are silent, the evil is guaranteed to continue growing. Today, it was Reb. Nati; tomorrow it can be any one of us. Every blogger in the JBlogosphere ought to publicize and condemn this immediately. This should have absolutely nothing to do with whether one is "right-wing" or "left-wing", "religious" or "secular". Everybody who values freedom and democracy should speak out. And kol haKavod to DovBear for having already done so. Every once in a while a newly discovered blog (new to me) or posting is so powerful that it just leaves me speechless. The "Miracle Girl" posting about Natan and Avital Sharansky's daughter's wedding was one such example of a posting that stopped me. It left me soundlessly with a..."wow." Today, I found a blog, that once again, has left me rather speechless. The trademark ® sign drew me in. I've usually only seen trademarks on clever blogs -- and to mesh such a shocking blog title of "my shrapnel" with an obviously deadpan byline piqued my curiosity. Message from the Bombing Victim Muppet: I am, of course, neither sad, nor heroic nor particularly victimized. What I am is an "ordinary Joe" who was seriously injured seven years ago in a suicide bombing while waiting for a bus at the Machane Yehuda open air market in Jerusalem. What's a bombing victim muppet look like? The juxtapostion of muppet with "bombing victim" was just too much. (I think this picture could work). She's an olah...in her 30s. As relatively non-observant as I was raised and I am, I have always felt my Judaism as this giant, prominent aspect of myself, like a huge birthmark. This has been the case ever since I was a small child. The peace treaty between Egypt and Israel was signed in 1979, when I was in fourth grade. My teacher talked to us about this historic event (it should be pointed out that I went to a public school) and had us reenact the signing of the treaty. She asked me to be Sadat. I refused. I had to be Begin. I was Jewish. How could I be anyone else? And...she was at the wrong place at the wrong time. Go read through her blog; start from the bottom and work your way up -- you'll be happy you did. Israel survives because of its people; Gila's optimism, candor and humor is a perfect example. I hope she keeps blogging. "Following the Israeli government's expulsion of Jews from Gaza, one person concluded, "The idea that a secular government could possess sanctity and be embraced by the religious as the "a tchalta de-ge'ulah" [beginning of the redemption] went down like the Titanic." As a Jewish settler who lives in the "West Bank", how have you seen Religious Zionism evolve since the Disengagement?" Israel is no stranger to limiting personal freedoms, be they freedom of religion, property rights, or expression. Web sites could be absolved of all responsibility for content published on their message boards, or talkbacks, if they agree to reveal the details of people posting on their sites, according to a bill approved Sunday by the Ministerial Committee on Legislation. The bill, which was drafted by MK Yisrael Hasson (Israel Beiteinu) would effectively define Web sites as newspapers to those who wish to press libel charges against statements made in various forums. While the owners, or editors, of a Web site would be legally responsible for the content on their site, they could be absolved of liability if they provide details of the users and posters. The bill would provide an extension to the current law, which allows courts to order a Web site to reveal users' technical information, such as their IP address. Perhaps Israel is only attempting to follow in Poland's footsteps (after all, they tell jokes about Israel in Chelm). Poland enacted a law as part of criminal penal code that states that "those who publicly slander the Polish nation for its alleged part in orchestrating or taking part in the crimes of the Communists or Nazis will be subject to a three-year prison sentence." Of course, don't go blaming all of Israel's legal silliness on the inherited laws from the Ottoman Empire, British Mandate, or Jordanian Law -- urban legends are just as important a factor in determining Israel's laws...as is MK Hason's desire to remove our anonymity. On January 31, 2005, the Knesset enacted a law (sorry, link is in Hebrew) that forbids the use of mobile phones in gas stations, with a whopping fine of NIS 12000 ($3260) for the criminals who dare to flagrantly endanger public safety. And where did the Knesset get such an idea? From an Urban Legend spam email going around. In case you do not know, there was an incident where a driver suffered burns and his car severely damaged when gasoline vapors ignited an explosion while he was talking on his mobile phone standing near the attendant who was pumping the gas. All the electronic devices in gas stations are protected with explosive containment devices, (intrinsically safe) while cell phones are not. READ YOUR HANDBOOK! Mobile phone makers Motorola, Ericsson, and Nokia, all print cautions in their user handbooks that warn against mobile phones in "gas stations, fuel storage sites, and chemical factories." Exxon has begun placing "warning stickers" at its gasoline stations. The threat mobile phones pose to gas stations and their users is primarily the result of their ability to produce sparks that can be generated by the high-powered battery inside the phone. Since Israel's lawmakers are too stupid to check spam emails and urban legends with the Snopes website (one of the internet's authoritative websites on proving or disproving Urban Legends), it's no shock we end up with silly laws on the books. It's worth reading the entire snopes entry on mobile phone and gas stations to see how pathetic the Knesset really is. For those who were adults or growing up in the late seventies and eighties this will mean a lot, especially if you were involved in the struggle for releasing Jews from the Soviet Union (like when Lurker and I got arrested at a SSSJ demonstration in NYC). For those who were involved and stood in Ben Gurion Airport (I skipped Yeshiva to be at the airport) or at the Kotel the day that Sharansky arrived in Israel, maybe even more. hat-tip; emailed to me from Tzvi @ Talmon. There are weddings and weddings in our lives. The weddings of ourselves, our relatives and our friends, and one generation later, the weddings of our children and our friend's children, which of course, are even more poignant than our own. There are the regular, every day, run of the mill weddings, the weddings where we ate too much or the music was too loud or we sat next to somebody's Relative From Hell, and then there are the other weddings - the one or two weddings, which for the rest of our lives, we will never forget. The wedding of Rachel Sharansky, the eldest of Natan and Avital Sharansky's two daughters, and Micha Danziger, a new immigrant from the United States, was one of those weddings. The Sharansky wedding at Kibbutz Ramat Rachel last Friday morning was never going to be, never could be, in any sense a normal wedding. During the coffee and cake reception before the ceremony, I observed among the hundreds of people there, two distinct groups: the young people who were simply happy to be participating in the celebration and who had little idea of the historical significance of the event, and the older people who had taken part in the drama of the Refusenik struggle and for whom Rachel's wedding was the grand finale and closing chapter of that astonishing narrative. My husband I wandered over to an alcove in the reception area to congratulate the bride. Rachel, more than radiant, more than happy, positively sparkled with her enjoyment of the day. Her lovely face, with its expression of intelligence, warmth and humor, looked up smilingly at every guest without a trace of nervousness of self-consciousness. The thought crossed my mind, as I stood at a distance where I could just enjoy looking at her, that this magical person very nearly did not come to be. In the configuration of the universe as we knew it in the early 1980's, the chances of there being a glowing Rachel Sharansky standing here in her wedding dress in 2008, were statistically very small indeed. All of us who participated in the demonstrations of those years, remember perfectly well, that whether Natan was in solitary confinement or on hunger strike or doing both together, there were times when we very nearly lost him. On one memorable occasion I remember how shocked my parents were when, twenty-five odd years ago, a group of us disrupted a concert of the Moscow Philharmonic Orchestra at the Royal Festival Hall in London. Half way through the performance, we shed our outside clothes to reveal the striped "prison uniforms" we were wearing underneath, and handcuffed ourselves to the railings of the balcony in the auditorium, yelling our Soviet Jewry slogans and shaking our fists. As the cellos and violins and violas of the Moscow Philharmonic came slithering to halt, we knew, in the dealthly silence that followed, that our Refusenik brothers and sisters would be listening thousands of miles away on the BBC World Service. It was only a few minutes before infuriated police officers arrived on the scene with large metal pincers to cut us free from the railings, but it was enough. I speak of it now as if it were a childish prank, but it was not an easy thing to do. We were young and idealistic, but we were also nicely brought up middle-class Jewish girls and boys. We had all been taken by our parents on one Sunday evening or another to hear a concert at the Royal Festival Hall. We had learned to sit politely and not fidget and not applaud between movements. For years we had enjoyed Tchaikovsky and Saint-Saens and Schubert in this bastion of British culture, and now we were more or less spitting in its face. The second before I had to stand up along with my friends, and shout at the top of my voice into the silent abyss of the stalls, my courage failed me and I did not think I could do it. The only thing, the only thing, which enabled me to get to my feet, was the thought of Natan in his solitary confinement cell, the thought of him never seeing Avital again. The reason why so many Jewish youth were participating in these demonstrations all over the world, was that Natan's story was not just a prisoner story, or a persecution story, or even a Jewish story. It was a love story. And it is this love story I am thinking of as I watch Rachel laugh and talk with all her guests, before her parents accompany her to her Chupah, before she marries Micha under the Jerusalem skies. I am here with her but I am not really here at all; I have risen in one second to my feet at the Royal Festival Hall, and have screamed : "Free Sharansky!" like an animal, at the respectable Russian musicians playing classical music on the stage below. I have always known, across all of the years, what I was shouting for that night. But today, looking at Rachel's face, at that beloved and wonderful genetic combination of Natan and Avital, today I really know. At the wedding reception I did manage to exchange a few words with the mother of the groom, Mrs. Danziger. "It's a great day for all of us", I said and she smiled and answered, "I know it is". But I couldn't leave it there. "She's the nation's baby" I explained, trying to hold back my tears. "She's our miracle girl". The weather forecast for Thursday, Friday and Shabbat had been discouraging – Rain, rain and more rain. On Thursday it rained all night. But God, one of the guests at the wedding, had decided to momentarily dispense with regular weather patterns for January, and Rachel and Micha took their place under a raised outdoor Chuppah, with a stunning view of the Judean hills behind and below them. The sun shone warmly and benevolently on the hundreds of people, Russians and Israelis and Americans and Brits, members of Knesset and rabbis and journalists and intellectuals, millionaires and philanthropists and activists and chairmen of committees, family and friends and very young babies and old age pensioners, who had gathered, with upturned faces, to watch the wedding ceremony unfold. A soft breeze played across the bride's face and lifted her veil into the air, so that she looked, for a moment, like a floating figure from a Chagall painting. "Sometimes a place is named for its future", said Rabbi Moti Elon who was the officiating Rabbi. "Kibbutz Ramat Rachel was named for you, Rachel. It was named for you to get married here." When it was time for the groom to break the glass, Natan took the microphone to say a few words. "I'd like to say something about why we are breaking this glass" he said, alternating seamlessly between English and Hebrew. "Thirty-four years ago, in a Moscow apartment, Avital and I stood under a sheet held up by four boys, for our own Chuppah. There were barely enough people to make up a minyan. We had never been to a Jewish wedding before, and we had no understanding of what to do. We mouthed the words that the Rabbi told us to say, without knowing their meaning. But the breaking of the glass, this we understood very well. We had one challenge, and the challenge was very clear to us. We knew that we had to get to Jerusalem. No matter what it would take, no matter how many years, we had to get to Jerusalem and build a home there. And this is what we did." "So now you are standing under the Chuppah Rachel, a child born in Jerusalem, overlooking Jerusalem, the first sabra in our family, marrying Micha, the first Oleh Hadash from his family. And this begs the question: Why should we break the glass at all? We are here, after all. Jerusalem has been rebuilt, and it is a vibrant city. But the reason we are breaking the glass is this: the challenge that faces you, Rachel and Micha, is different to the challenge that faced us. You will make a home in Jerusalem, yes, but you must simultaneously have your feet on the ground, building a Jerusalem shel mata, a physical Jerusalem, while always keeping an eye on the Jerusalem shel ma'alah, on what it means, on what it represents. It will be your mission, and the mission of all your generation, to defend Jerusalem, to protect her, to keep her safe. And I think that your challenge may, in the end, be even more difficult than ours". It will rain later, but not yet. I am standing in the sunshine, listening to Natan, looking at Avital, and glorying in Rachel, who has pushed her veil away from her face, so that she can see better, and hear better, everything that is going on at her wedding. She looks up at her tall, straight, young husband and smiles, and all of us watching her feel, that this is the just kind of person to whom we can entrust the future of Jerusalem. Mazal Tov on your wedding Rachel Sharansky. Mazal Tov, miracle girl. Katie Green, an independent film producer and director, is head of PR at the Ma'aleh Film School, Jerusalem. NB: I received this posting by email without any link to where it came from..and posted it as is. I just located this post at Aryeh Green's blog (Katie's husband) and am including the rightful link. Actually, I'm so busy that an event I normally would have gone to, I had to pass up. 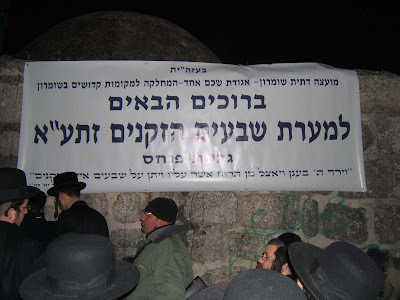 One night a year, the IDF allows access to the village of Anapta in the Shomron/Shechem region, and allows Jews to pray at the graves of the 70 Zekeinim and 2 of Aharon HaCohen's sons -- Itamar and Elazar. For those of you who don't know, Rafi G's "Life in Israel" blog has many posts that could easily be found here (and vice versa). Since I couldn't go to Anapta last week, I did the next best thing -- I called up Rafi G and he blogged it. So what was I doing in the hills of the Shomron in sub-zero weather? That leads us to the review of my latest Adventure in Eretz Yisrael..
At about 8:30 PM on Thursday night, Jameel calls me up on the phone. Whenever Jameel calls, you know something is up. He tells me that he just got word they are opening the village of [I could not catch the name of the village], and this is a place they only open to Jews once a year. In this village are the grave sites of Elazar and Isamar, 2 of the sons of Aharon Ha'Kohen, and the gravesite of the 70 elders. The buses would be leaving from "Bat Shalosh" at about 12 am and there was no need to pre-register. We went over the directions quickly, and hung up. I called Jameel about 10:15 to go over the directions again, as I am not as familiar with the roads of the Shomron as he is. He tells me that he probably would not be going, but we went over the directions again. So I head out to the Shomron. The trip was pretty smooth. Driving through the Shomron at night is a bit spooky, if you are not familiar with the roads. You drive through some Arab villages that straddle the "highway". You know that if you make a wrong turn you will end up on the morning news as the victim of a lynching. The signs "could be better", the lighting of the roads "could be better". Read it all here (with pictures) at Life in Israel. A hearty yasher koach to our friend Jameel for his continued success in blogging and waffle making. Not only is he a master chef, but he is proving to be one of the smarter voices broadcasting from Eretz Yisrael. I make a mean waffle but I don't get the same recognition as our wafflemaster. Kol Hakavod, now pass the syrup. P.S. I'll be back in a month. We need to plan our next tiyul. P.P.S. Now that Soccer Dad is stepping aside I am going to take over admin of Haveil Havalim. This is a special request to keep the submissions coming and to encourage my fellow bloggers to take a turn as host, besides you just might win a golden waffle breakfast. More on this later. In his speech upon arriving at Ben Gurion Airport, President Bush called upon Israel to negotiate with the Palestinians on all "core issues" -- including the "right of return" of Palestinian refugees to pre-1967 Israel. This is an enormous departure from existing U.S. policy: In the past, no American administration has ever expressed support for the supposed "right of return", or even used that loaded expression. In fact, even the Europeans have never used the term. The reason is obvious: The very use of that phrase (unless prefixed with "so-called" or "claimed") implies that such a right actually exists – a position never taken by the U.S. (The term that has always been used is "the Palestinian refugee problem".) It is universally understood that granting millions of Palestinians a “right of return” would result in the instant demise of the Jewish state. In spite of the extreme precedence-setting significance of Bush's statement, nearly the entire Israeli media seems to have completely ignored it. There were a couple of exceptions: On Israel Radio’s Reshet Bet Thursday morning, between 7:00 and 8:00, Aryeh Golan mentioned the statement several times, and pointed out that it seems to indicate a radical change in American policy. He also played a tape of Bush making the statement. 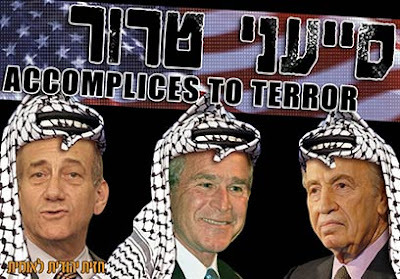 As the day progressed, however, Israel Radio stopped making any further reference to Bush's talk of the "right of return". Upon his arrival at Ben-Gurion Airport, Bush said that the US's alliance with Israel helps "guarantee Israel's security as a Jewish state." This is widely considered code for a rejection of the Palestinian claim of the "right of return." Bush made no mention of this at the press conference. Is it conceivable that the entire media would conspire to black out a statement made by the President of the United States in a public speech? Apparently, it is. This is something that ought to scare the hell out of any person who values freedom and democracy. Apart from the grave issue of the media's cover-up and lying to hide Bush's statement, we ought to ask how it is that Bush came to make this statement in the first place. It isn't exactly a secret that Bush isn't the brightest bulb in the chandelier. When he referred, in his statement at Ben Gurion, to "the uneducated on the issue", he probably was thinking first and foremost of himself. On his own, the President knows very little about foreign policy issues, and his close advisors carefully prepare all his public statements for him. So who, exactly, fed him the line about the "right of return"? Sustainable negotiations leading to a final peace settlement along the lines of President Bush's two-state solution, which would address the key final status issues of borders, settlements, Jerusalem, the right of return, and the end of conflict. At the time, this completely unprecedented reference to the "right of return" created a stir. One Middle East analyst who had participated in the Iraq Study Group discussions was very surprised to find this statement in the report. "'Right of return' is not in Oslo I or Oslo II, it's not in the Bush Rose Garden speech, it's not even in UN 181, the original partition resolution – it's part of the Palestinian discourse," said the analyst. So what was it doing in the report, then? The analyst speculated that it might have been "a deliberate attempt to fuse something to the Bush rhetoric which wasn't there before". A year later, that attempt has borne fruit: It's impossible to notice the uncanny similarity between the statement in Baker's report, and Bush's statement on Wednesday. It seems that the antisemitic Baker has once again become a major factor in setting U.S. Middle East policy. Funeral going on now in Jerusalem for the Rosh Yeshiva of Mir in NY, Rav Shmel Birenbaum. zt'l. Katyusha attack last night around 2 AM on Northern Israel. Last night around 2 AM, 2 katyusha rockets were fired from South Lebanon into Israel, hitting the community of Shelomi. No injuries were reported; the 2 rockets landed on a street and in someone's back porch causing minimal damage. Did you know that a month ago 2 additional rockets landed in Kiryat Shmona? In light of the upcoming Bush visit, posters have been put up around Jerusalem. Since free speech is something not yet internalized by the Israeli government, police or courts (let alone the media) -- the posters are being called "hate posters" and "incendiary" (though calling the posters "incendiary" would in my opinion seem to be incitement, but never mind). Oh, and those putting up the posters were arrested by the Police. Nice. Judge for yourself...do you think the message of releasing terrorists and providing them with weapons and ammunition is accurately expressed by this poster? Bush is coming - traffic's stopping. Ive received this about 10 times from different people so far. Traffic around Jerusalem and on the main highways into Jerusalem is going to be a mess for the upcoming days due to Bush's arrival. Traffic changes for the capital: Motorists and city residents should expect massive traffic congestion and road lock-down in central Jerusalem starting Wednesday morning for the three-day visit of US President George W. Bush. Police urge the public to avoid the area around King David Street altogether. STREET CLOSURES: Tentative schedule for street closures in central Jerusalem around King David Street for Bush's visit. NO PARKING: From Tuesday night, no parking will be allowed on the following streets: Gaza, Rupin, King David, Agron and Jabotinsky. Any vehicle parked on these streets will be towed to a special lot to be set up in the city's Teddy Stadium. Police will leave notices on buildings along the main streets and areas scheduled to be closed, with a timetable of planned closures. Police appeal to the capital's citizens to use public transportation for the duration of the visit to reduce congestion. Egged bus routes will be altered according to security needs. POLICE HOTLINE: 1-700-506-677 with real-time updates on closures and recommended routes. The worst news though; US considering an international force in "West Bank"
The US is preparing a plan to station third party troops in the West Bank to secure the area after an Israeli withdrawal and before the Palestinian Authority can take over full security control, The Jerusalem Post has learned. The issue of how to deal with the period between when Israel leaves large swaths of the West Bank and the PA is able to take over control is likely to be discussed during talks President George W. Bush will hold in Jerusalem and in the PA on Wednesday and Thursday. "I just want to you know that I'm impressed." My wife paid me this valuable compliment last week. Granted, I deserved it, but it was nice receiving it regardless. My daughter "D1" informed me, "You know Abba, you really yelled loudly when you chased that mouse around the house." About a year ago, our yishuv was plagued by the mouse syndrome. We had no clue where they coming from, how they were getting into the house, or where they were hanging out. Yet the phrase "I smell a rat" was never truer when my wife announced we had a mouse in the house last year (her keen sense of smell is only matched by my sharp instincts for waffles). We purchased a few mouse trap cages, filled them with salami and peanut butter bait, and started catching mice -- we even managed to catch 2 in one cage. I would don heavy work gloves and drive the mice a few miles down the road and release them into the wild. If only...if only we had a better solution. And then, one day about 5 months ago, he arrived. Along with the table scraps we fed the creature daily, we splurged and purchased *cat food* for the beast. So the cat adopted us, we adopted it, and for the first time since our goldfish died our household had a pseudo pet. Our disposition changed last week when my wife announced, "I smell a rat" -- and the mice were back. We would growl at the cat, "Hello?! What are we feeding you for?!" We would even invite the cat in to hunt for the mouse, but all it cared about was more table scraps or ready to eat cat food. Day by day we got increasingly annoyed at the cat. Finally, one morning last week, one of the kids screamed in my ear to wake me up; "ABBA! Wake up!! There's a mouse downstairs!" Tumbling down the stairs, I needed to appear fearless. After all, how could a member of our combat counter-terror unit be afraid of a mouse? Putting on my heavy work gloves and brandishing a broom, I gingerly opened the bottom drawer of the oven. The grey mouse gaped at me wide eyed; cornered at last! With a killer yell, as I banged the broom in the general direction of the mouse, and it jumped out, scampering across the floor. Continuing the yell, I chased it around the downstairs -- even opening the screen door to give it ample chances to escape. Stupid mouse. It didn't go out the door but kept hiding in the corners of the room. "Bring in the cat!" I roared -- and the kids tried getting the cat into the house, but to no avail. The stupid cat had no interest in the mouse whatsoever. After an aggressive to and fro chase around the room, I smacked the mouse with the broom, and it went into convulsions. "EEEEEWWWWWW" was the general consensus in the house, while I was very pleased with myself for mortally wounding the annoying rodent. "Get the cat," I insisted -- "let's show it what its supposed to do." The cat gingerly approached the dying mouse, but turned head on heels and fled out the door. Disposing the bleeding mouse in the garbage I had no sympathy for it whatsoever. I had given it an escape route out the screen door, given it the opportunity to get caught in a cage -- and I would have released it far away. Yet what will be of our cat? I shudder to think I just wrote "our" cat. It's THE cat, not ours. But the stupid pet grew on us. I guess I'll take it to the vet one of these days, get some shots for it, and keep feeding it like we have till now. someone (a layman) "decided" what the halacha is, or isn't, concerning their cat -- "sold" it to a Moslem to be neutered, and then "purchased" it back. Shmuel Dovrat, a young religious animal lover, recently came up with a creative solution for the halachic ban on neutering pets. Dovrat sold his beloved cat Ponti to a Muslim friend who spayed the feline, and bought it back from her immediately after the procedure. 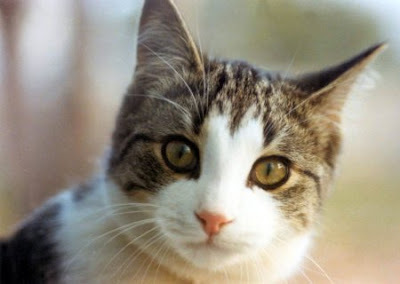 "Our cat, Pontius Pilatus, reached sexual maturity and started peeing all over the house," Dovrat recounted, explaining this is one of the side effects of sexual arousal in cats. Dovrat and his wife realized that without spaying Ponti they would not be able to keep him, but every halachic ruling they consulted made it clear that neutering an animal was strictly forbidden. Throwing Ponti out into the street would have been cruel, and leaving him in the current situation would have also caused the cat to suffer, said Dovrat. And so, he and his wife decided to explore halachic sources in a bid to seek a solution to the dilemma. After thoroughly reading through the rulings of some of the greatest Halacha adjudicators, Dovrat came to the conclusion that the halachic ban on neutering refers to farm animals, and not to pets. However, in order to be absolutely sure his actions did not violate Jewish law, he decided to sell Ponti to a Muslim friend and have her take the cat to the vet for the operation. Once the cat has recovered, Dovrat bought it back from the friend, paying the same price he got for selling it earlier, and also reimbursing her for the cost of the operation. "I have no doubt that an adjudicator knows more about the Halacha than I do, but I feel uncomfortable with some of the rulings. I don't like to be fed halachic solutions with a spoon. It's always important for me to know the source and understand the process that led to the ruling," Dovrat explained. However, Ramat Gan's Chief Rabbi Yaakov Ariel, who about a year ago ruled that surgical neutering was forbidden by the Halacha, said he did not agree with Dovrat's solution. Ariel explained that while the great adjudicators indeed allowed Jews to let their Muslim neighbor spay their animal for them, if he wished to do so, they were never allowed to initiate such a moved themselves. Ariel, who supports "hormonal neutering," also rejected the claim that refraining from spaying a pet constitutes cruelty to animals. "People buy dogs and cats in order to entertain their children, and not out of concern for the pets' welfare. If they are worried that the animals might have puppies and that no home could be found for them, they should find another form of entertainment to begin with," he stated. R' Kook would be mortified...I'm disgusted. On behalf of the Government of Israel, I hereby invite you to visit the State of Israel to partake in Peace Negotiations. Recognizing that you might not wish to visit the Jewish state, we are prepared to meet with you at any other location. As a strong leader and the ideological representative of a significant percentage of the Arab nation, we recognize how imperative it is for us to reach a peace agreement with you at all cost, no matter how painful the solution. In line with our current peacemaking policies we are prepared to offer the following preconditions to any agreements. -> The State of Israel will arm and train your military forces with an unwarranted and disproportionate supply of weapons. -> The State of Israel will actively and publicly work on rehabilitating your image with President George Bush during his upcoming visit to Israel. -> The State of Israel will demand that all Al Quaida prisoners worldwide be released in exchange for a verbal commitment to commit no more acts of terror (the verbal commitment will of course be optional). -> The State of Israel is prepared to discuss any territorial concession you feel are needed (with the possible exception of Tel Aviv). -> The State of Israel is prepared to accept moral and fiscal responsibility for having created any situation that Al Quida claims Israel created and we are ultimately responsible for any acts Al Quida may have taken as a result. We hope you look upon our offer favorable, and we are prepared to send you some planes to fly you and your staff to any meeting place you desire, and perhaps to watch a soccer game with me on TV. There's a new blog I've gone to a few times over the past month called "Baal Mofes" -- the master of magic. He puts up videos of "miracles" (from the Tanach, and later) that he has recreated using "slight of hand," chemistry, or whatever it takes to convince people of a magic trick. The 10 plagues are a major theme of last week's (and this coming week's) parashat shavua, so I thought it would be interesting to show a video of a very cool trick, and how's it done as well. Seems to me the "magicians" in Egypt could have learned a thing or two from Penn and Teller. The Israeli Government's latest edict comes from the Avi Dichter, Minister of Internal Security. "Jews are allowed to pray on the Temple Mount," he stated, "as long as they don't move their lips." Seems like our sovereignty of "The Temple Mount is in our hands" grows weaker by the day. I wish I could find the picture I once posted years ago, of Israeli policemen dragging a Jewish woman off the Temple Mount, with a policeman's hand clamped over her mouth. Her crime? Soundlessly whispering Tehillim on the Temple Mount. I wonder what additional by-laws Dichter has in store for us? Can one shukel? Place your hand over your eyes as if saying Shma? Can you hold your hand over your mouth and move your lips so it's not seen by the Israeli prayer police and Moslem Waqf? It is not possible to arrest a person for 'conversing with his maker,'" Dichter replied, using the same terminology of the MKs' letter. "However it is possible to carry out an arrest for expressions of outward and demonstrative signs [of prayer]." What wonderful neighbors we have. A "near certain likelihood of subsequent bloodshed" if we move our lips in prayer...or go hiking in the Hevron mountains. People that support these monsters are only mirroring their own potential behavior. R' Aharon Soloveitchik and Hevron's Settlers. They had absolutely no obligation to go there even if it was to save the lives of others… which it wasn't. They placed themselves at risk… and paid dearly for it. It cannot be ignored that had they heeded Halacha and not gone into a Makom Sakana, a dangerous place they would still be alive today. This Halacha seems to have been lost on the Religious Zionist rabbis who praised these two hikers for having the 'courage' to hike in dangerous territory. Instead of conveying a message of how dangerous it was to go hiking there they are adding to their image as martyrs. I also don't think my understanding of the Arab/Muslim mindset is all that different from that of the most militant religious Zionist. I know what Muslim/Arabs are thinking. It is pretty much the same as what Ahmadinijad thinks. Which is why taking a hike in an unsecured and open area like these two soldiers did was wrong. Going for a hike in Eretz Yisrael, with 2 soldiers in elite units (Shaldag [IAF] and Shayetet 13 [Navy]) in an area they knew inside out, is far from irresponsible. Instead of placing the blame on the terrorists (Fatah, Hamas, Islamic Jihad), those who send and incite them (Palestinian Authority), those that release terrorists and give them weapons and ammunition (Olmert & co.), and those who offer political support to their cause (Bush and Rice) -- of all the people possible, R' Maryles has chosen...to blame the Jewish victims. Outside of Hashem's Divine Providence, Israel exists today because of the combined efforts of Settlement and the Army. Since the establishment of Modern Israel over 100 years ago, it was Jews moving to all parts of Eretz Yisrael and LIVING there, that enabled the founding and continued existence of the State. From Eilat to Ramat HaGolan, from Hevron to Gav HaHar, it is the Jewish presence that keeps the army vigilant. Were it not for the Jewish community in Hevron -- Mearat HaMachpela would look very similar to Kever Yosef (and entrance would be just as difficult). Sherri Mandells agonizing over the loss of a 13 year old son. Can anyone who hasn't experienced what she has possibly begin to understand her sacrifice? Was her sacrifice ultimately so necessary?!" Kobi Mandel was a 13 year old who went to explore the caves in the backyard of his settlement, Tekoa. A group of Palestinian teenagers stoned to death Kobi and his friend. Kobi's crime? A Jewish teenager exploring a cave. Why is R' Maryles blaming Kobi...or his parents? R' Maryles is apparently tired. We are not. We will continue building the land, touring the land, and securing the land for ourselves and for all of Am Yisrael, including R' Maryles. The big danger is getting tired. Ehud Olmert stated "We are tired of winning [against the Arabs]" -- and has started a downward spiral of capitulation which will lead nowhere, but G-d forbid, the destruction of the Jewish rebirth in Eretz Yisrael. In the Torah, parashat Ki-Tezeh, Moshe admonishes the Children of Israel -- the reason they were attacked by Amalek is because, "זכור את אשר עשה לך עמלק בדרך בצאתכם ממצרים, אשר קרך בדרך, ויזנב בך כל הנחשלים אחריך, ואתה עייף ויגע, ולא ירא אלוקים". The Children of Israel were tired and weary. Capitulation, throwing Jews out of their homes, giving away land to the enemy (let alone guns and ammunition) is the last thing we need. Please see this wonderful video of R' Aharon Soloveitchik zt'l -- what he thought of the settlers in Hevron.